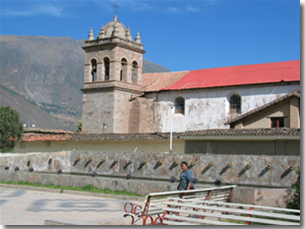 Calca is located 50 km from Cusco. This area has a beautiful landscape, surrounded by the Pitusiray and Sawasiray snow-capped mountains. The archaeological complex of Huchuy Qosqo is located in this province, as well as the medicinal hot mineral baths of Machacancha (sulfurous hot water) and Minasmoqo (cold bubbling mineral water). During the Inca empire, Calca was an important population center with an amazing administrative organization. This can be seen from the beautiful pre-Hispanic walls in the streets and plazas of the current population, as well as the great archaeological monument of Juch'uy Qosqo. The perpetual ice peaks of Sawasiray and Pitusiray also stand out: these were important divinities and gave origin to the legend of Pitusiray. The monument of Juch'uy Qosqo is a fabulous archaeological monument located 5 kilometers south of the city of Calca. Juch’uy Qosqo means "Small Cusco", but no one understands why this name was assigned, since in general, it looks like all inca cities and it definitely does not have any resemblance with the city of Cusco. The Inca name is known as K’ajya Qhawana and it is translated as "where the lightning looks". The chroniclers, due to their lack of knowledge of the Quechua language, made various forms of the same name like Caquia Xaquixaguana, Sacsahuna, Xaquixaguana, Huana among others.